Controlled Access – Keys are electronically programmed to open only specific locks during a designated schedule. Schedules may also contain an expiration point to completely disable the key until it is audited and reprogrammed. Accountability – Audit information recorded in both the lock and key shows a time-and-date stamped record of every event, including authorized accesses and unauthorized attempts. Electronic Rekeying & Scheduling – Respond quickly to security threats, lost or stolen keys, or personnel changes without the added cost of changing your locks and keys. Easy Installation – Medeco XT key provides all power to the cylinder, eliminating the need for any hard wiring or power supply. Simply remove the existing mechanical cylinder and install the Medeco XT cylinder. Physical Security – Medeco XT products add a wide variety of intelligent features without compromising on physical security. Attack-resistant design and tamper-proof features provide strong protection against forced entry. Efficient System Management – Medeco XT software contains tools that will help you manage your security more efficiently. Flexible programming, scheduled access and full audit reports are offered with the convenience of stand-alone or web-based software. Warranty: Medeco® warrants Medeco XT products to be free of defects in material and/or workmanship for a period of two (2) years from date of original purchase. 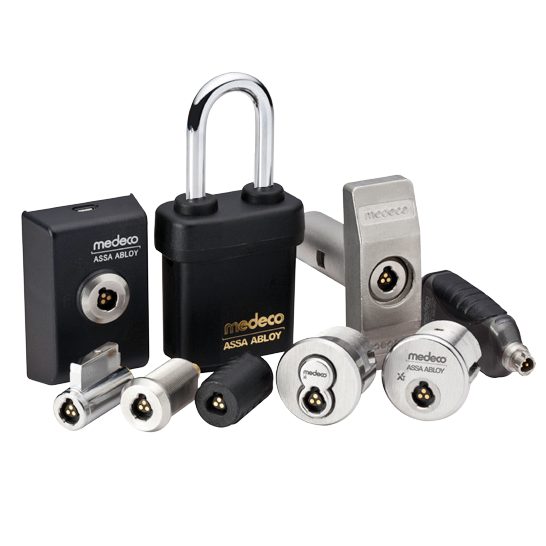 Formats: Medeco XT eCylinder technology is available in SFIC, Cam Locks, Padlocks, Cabinet Locks, Plunger Locks, Key in Knob/Lever, Rim Cylinders, Mortise Cylinders, International Cylinders and T-Handle cylinders, just to name a few.